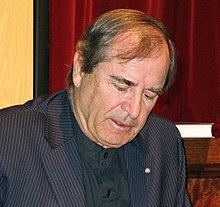 Paul Edward Theroux (born April 10, 1941) is an American travel writer and novelist. Fiction gives us a second chance that life denies us. New York Times (July 28, 1976). “Paul Theroux, Restless Writer Of the Rails“ by Paul Hendrickson, Washington Post (September 20, 1979). The realization that he is white in a black country, and respected for it, is the turning point in the expatriate’s career. He can either forget it, or capitalize on it. Most choose the latter. Tarzan Is an Expatriate, quoted in Patrick Marnham's Dispatches from Africa, ch. 1 (1981). “Mustn’t grumble” was the most English of expressions. English patience was mingled inertia and despair. What was the use? But Americans did nothing but grumble! Americans also boasted. "I do some pretty incredible things” was not an English expression. "I’m fairly keen" was not American. Americans were showoffs — it was part of our innocence — we often fell on our faces; the English seldom showed off, so they seldom looked like fools. The Kingdom by the Sea: A Journey Around Great Britain, ch. 1 (1983). The Peace Corps is a sort of Howard Johnson’s on the main drag into maturity. I have always disliked being a man. The whole idea of manhood in America is pitiful, in my opinion. This version of masculinity is a little like having to wear an ill-fitting coat for one's entire life (by contrast, I imagine femininity to be an oppressive sense of nakedness). "Being a Man" (1983), from Sunrise with Seamonsters: Travels and Discoveries, 1964-84 (Houghton Mifflin, 1986, ISBN 0-395-41501-2, 384 pages), p. 309. Hawaii is not a state of mind, but a state of grace. Observer (London, October 29, 1989). Death is an endless night so awful to contemplate that it can make us love life and value it with such passion that it may be the ultimate cause of all joy and all art. Book published to raise money for AIDS victims. Animal lovers often tend to be misanthropes or loners, and so they transfer their affection to the creature in their control. Living With Geese, Smithsonian Magazine (December 2006). Assigning human personalities to animals is the chief trait of the pet owner—the doting dog-lover with his baby talk, the smug stay-at-home with a fat lump of fur on her lap who says, "Me, I'm a cat person," and the granny who puts her nose against the tin cage and makes kissing noises at her parakeet. Their affection is often tinged with a sense of superiority. Deer and duck hunters never talk this way about their prey, though big game hunters— Hemingway is the classic example — often sentimentalize the creatures they blow to bits and then lovingly stuff to hang on the wall. Fogeydom is the last bastion of the bore and reminiscence is its anthem. It is futile to want the old days back, but that doesn't mean one should ignore the lessons of the visitable past. Remember the Cicadas and the Stars?, International Herald Tribune (January 2, 2007). I sought trains; I found passengers. Extensive traveling induces a feeling of encapsulation, and travel, so broadening at first, contracts the mind. The Japanese have perfected good manners and made them indistinguishable from rudeness. The trouble with cameras is that people see them a mile away. You define a good flight by negatives: you didn’t get hijacked, you didn’t crash, you didn’t throw up, you weren’t late, you weren’t nauseated by the food. So you are grateful. You must not judge people by their country. In South America, it is always wise to judge people by their altitude. Tightfisted people are as mean with friendship as they are with cash--suspicious, unbelieving, and incurious. In many ways connection has been disastrous. We have confused information (of which there has been too much of) with ideas (of which there are too few. I found out much more about the world and myself by being unconnected. Even the most distant and exotic place has its parallel in ordinary life. You have to find out for yourself. Take the leap. Go as far as you can. Try staying out of touch. Become a stranger in a strange land. Acquire humility. Learn the language. Listen to what people are saying. This page was last edited on 6 August 2018, at 18:28.